Barbara C. Luna is a Senior Partner in the accounting and litigation services firm of White, Zuckerman, Warsavsky, Luna & Hunt, LLP. 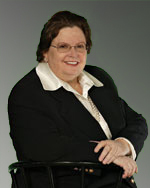 She has served as an expert witness for over thirty years in business and personal injury litigation and bankruptcy matters. Dr. Luna analyzes financial, accounting, economic, business, real estate and valuation issues relating to liability and damages in litigation matters and reorganization of businesses. The matters she has been involved in include breach of contract, intellectual property, unfair competition, construction and real estate, business interruption, business dissolutions, bankruptcy, partnership disputes, professional malpractice, fraud and misrepresentations, securities, trusts and estates, bad faith, alter ego, wrongful termination, personal injury, products liability and marital dissolution. She has testified on numerous occasions in U.S. District Court, Superior Court, Bankruptcy Court, arbitrations and depositions. Prior to joining White, Zuckerman, Warsavsky, Luna & Hunt, LLP, Dr. Luna was a Partner with Coopers & Lybrand specializing in litigation and financial advisory services. Prior thereto, she was the National Director of Litigation Consulting for Kenneth Leventhal & Company, where she was responsible for directing the litigation services practice nationwide. Previously, Dr. Luna was a Partner with Pannell Kerr Forster, where she was responsible for providing litigation and reorganization services, and she was a Senior Manager with Price Waterhouse specializing in litigation services. Before focusing on litigation services, she was an investment banker specializing in corporate finance. Dr. Luna has taught graduate and undergraduate courses in working capital management, business finance, forensic accounting and intermediate accounting at the UCLA Graduate School of Management, California State University at Northridge and Pepperdine University. She has addressed numerous audiences and has appeared on several professional panels. She obtained her MS and PhD degrees in Applied Mathematics from Harvard University and her BA degree from Wellesley College. Dr. Luna is a Certified Public Accountant, a Certified Fraud Examiner, Certified in Financial Forensics, a Master Analyst in Financial Forensics, an Accredited Senior Appraiser in Business Valuation, Accredited in Business Valuation, a Certified Valuation Analyst, a Certified General Real Estate Appraiser, a Certified Commercial Real Estate Appraiser, a Certified Residential Real Estate Appraiser, a Certified Management Consultant, and a Diplomate Board Certified Forensic Examiner and Accountant. She is a member of the American Institute of Certified Public Accountants (and holds the AICPA’s CFF and ABV designations), the California Society of Certified Public Accountants (and the Society’s Economic Damages, Fraud and Business Valuation Common Interest Member Services Committees), the Arizona Society of Certified Public Accountants, the Association of Certified Fraud Examiners, the Association of Business Trial Lawyers (and the Association’s Committee on Experts), the National Association of Forensic Economists, the American Boards of Forensic Examiners and Accountants, the American Society of Appraisers, the National Association of Certified Valuation Analysts, the National Association of Real Estate Appraisers, and the Institute of Management Consultants and an associate member of the Appraisal Institute.